Did you know that cats give off about 10 watts of heat and dogs about 15 watts. I suspect that a friend of mine with a Great Dane gets as much heat from his as a human though – roughly 100 watts. I was told this whilst being shown round Bedzed – Beddington Zero Energy Design Building. This green apartment complex on the outskirts of London makes the most of heat from a variety of sources. The most impressive thing is that none of the flats actually have radiators – they’re not needed. The building is very well insulated, they’re designed to optimise heat from the sun and they also make the most of body heat too! One of the ways they do this is by creating a building that’s used for both residential and office space. This means there are people around all the time – keeping the space warm. There are 99 flats in total – and there are only three boilers servicing all of them. These are used for hot water. But it means that each dwelling is using about 83% less gas than people living in neighbouring properties. And 40% less electricity. They’re also efficient in their water use. The average person in the UK uses roughly 153 litres of water per day but at Bedzed it’s nearly half that. However, I learnt that in the US the average is 460 litres of water a day per head and in Las Vegas it’s a staggering 1300 litres! And Las Vegas is a desert area. One of the ways they save on water is by putting bubbles in it. This makes the spray from taps look like there’s a lot of volume, when actually, there’s not very much. Low flush loos also play a part. 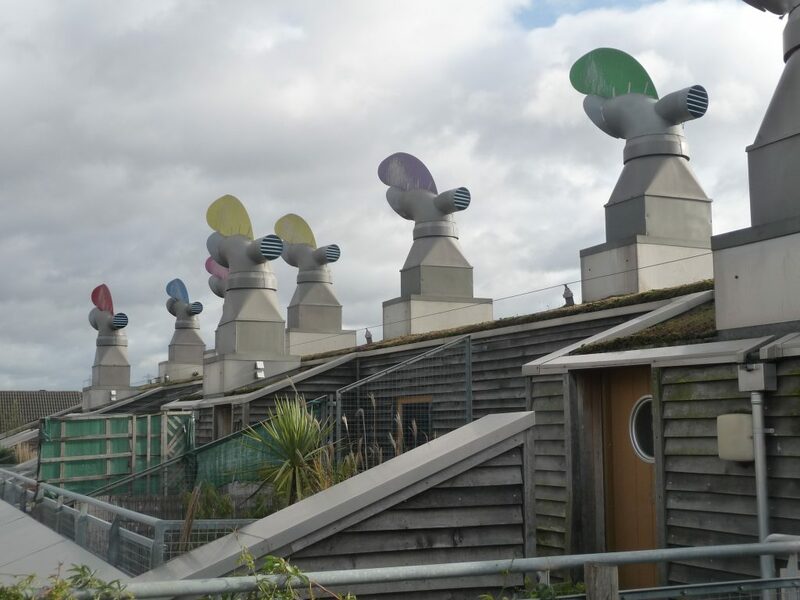 This was my second visit to Bedzed – the first was about a year after it started in 2003. This time I came with about 20 school children as part of the British Gas Generation Green Think Tank, that I am leading. It is our third visit to a ‘green’ project. The first was to Closed Loop Recycling in Dagenham, where they recycle plastic bottles. The second was the Met Office in Exeter, where the children learnt something about the science of climate change. Our next trip will be to the Houses of Parliament, to present the children’s policy ideas. The plan is to invite MPs, including the Prime Minister, to hear what they have to say. And to understand that there are lots of children who are concerned about their future and want to do something about it. The great thing about Bedzed was that it was a real illustration of how attractive green living can be. None of the children would have preferred to live in the neighbouring buildings – a bog-standard development, with no green rooves, electric cars or community living. And Bedzed research showed that people living there generally knew about 20 of their neighbours. The equivalent figure for the UK is 3 neighbours. You can see from the photos that the roof top cowls are very striking. They move with the wind and effectively ventilate the building, so the super thick insulation doesn’t make it too stuffy. It’s a great pity there aren’t more buildings like this. Having sat on the District Council in my area I think there’s not nearly enough incentive to go this route. We need more innovation and green thinking – remembering that we’re building in problems or solutions for many years ahead. If builders can’t do it they shouldn’t be given planning permission – perhaps that’s one of the messages the children will be taking to Government. This entry was posted in BLOG, Campaigning, Cities & Towns, Done, Green Building, News 2009. Bookmark the permalink.